The Shenandoah County Courthouse is located in the center of Woodstock in the northern part of the Shenandoah Valley in Virginia. Shenandoah County was formed in 1772 from Frederick and Augusta Counties. It was originally called Dunmore County after Virginia Governor Lord Dunmore. The County was renamed in 1778 during the American Revolution. 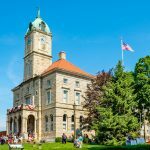 The courthouse is one of only three surviving courthouses built between the American Revolution and the end of the century. It is also believed to be the first two-story courthouse in Virginia. 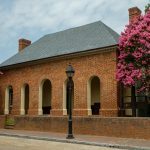 It is also Virginia’s oldest surviving courthouse west of the Blue Ridge Mountains. The area that is now Shenandoah County was first settled by German immigrants who had moved south from Pennsylvania. They brought with them German customs, religious beliefs, art and architecture, which continue to exert a strong influence in the region today. The county seat of Woodstock was founded about 20 years before the formation of the county. 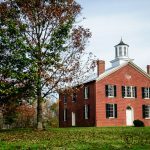 It was formed by a land grant from Lord Fairfax in 1752 and named Muellerstadt (Miller Town) after its founder, Jacob Miller. The town was renamed Woodstock as part of the town’s charter sponsored by George Washington in the Virginia House of Burgesses in 1761. 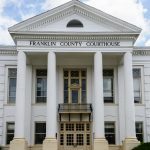 Being in the center of the county made Woodstock the obvious choice for the county seat when the county was formed in 1772. 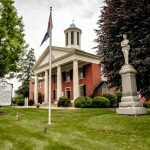 The Shenandoah County Courthouse was built in 1795 replacing a log cabin that had been serving as the courthouse since 1774. The design of the building reflects the German heritage of the county’s population. The two-story building is constructed in rough-hewn limestone and topped with a highly baroque hexagonal cupola. 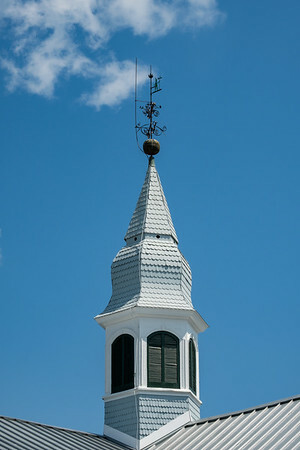 The cupola, which was prescribed in the original specifications, is very reminiscent of German baroque parish churches. The courthouse is unusual because of the mixture of different architectural styles. Early Republic, American Vernacular and German Baroque can all be seen in the original construction. A Greek Revival single story brick wing was added in 1840. Victorian architecture was used for the 1880 addition to the rear of the building which housed the clerk’s office. The Tuscan Revival portico was added in 1929. The building is set back about fifty-feet from Main Street (US Route 11). The area in front of the courthouse has been used to muster troops for all wars from the War of 1812 to World War II. Today, this area contains a bust of John Peter Gabriel Muhlenberg. 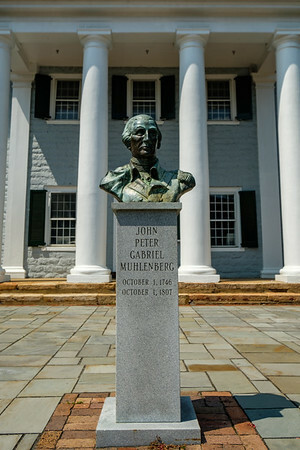 Although ordained as an Anglican minister, Muhlenberg served as pastor to the Lutheran congregations in Woodstock. A colorful, although unauthenticated, tale tells of a sermon given by Muhlenberg on January 21, 1776. The text of the sermon was taken from Ecclesiastes. It begins “To everything there is a season…” When he reached the eighth verse “a time of war, and a time of peace” he is said to have declared, “and this is the time of war” at which point he removed his clerical robe revealing a Colonel’s uniform. The following day he marched out of the town leading 300 men from the county which became the nucleus of the 8th Virginia Regiment. The Shenandoah County Courthouse was listed on the National Register of Historic Places in June 1973. A new circuit court was completed the same year across Court Street. The building now houses a visitor’s center, museum and offices. 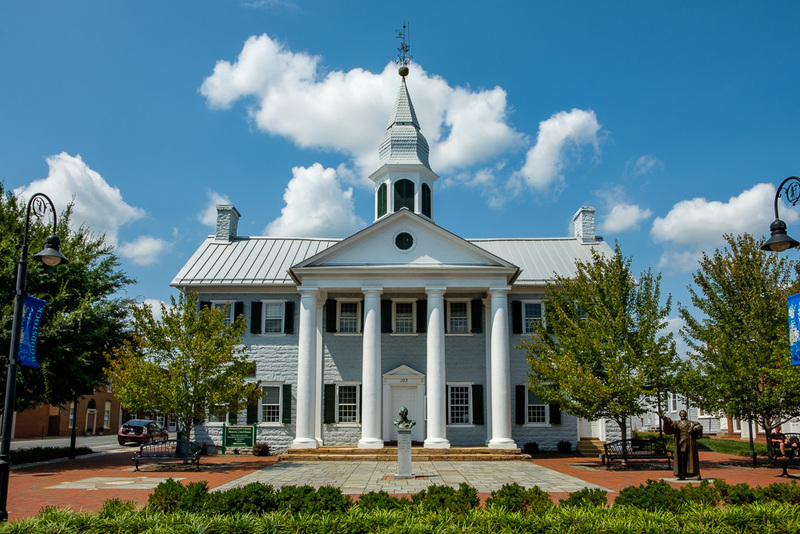 The Shenandoah County Courthouse is located in the center of Woodstock in the northern part of the Shenandoah Valley. 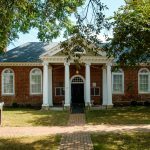 Built in 1795, it was the first two-story courthouse in Virginia and is the state's oldest surviving courthouse west of the Blue Ridge Mountains.